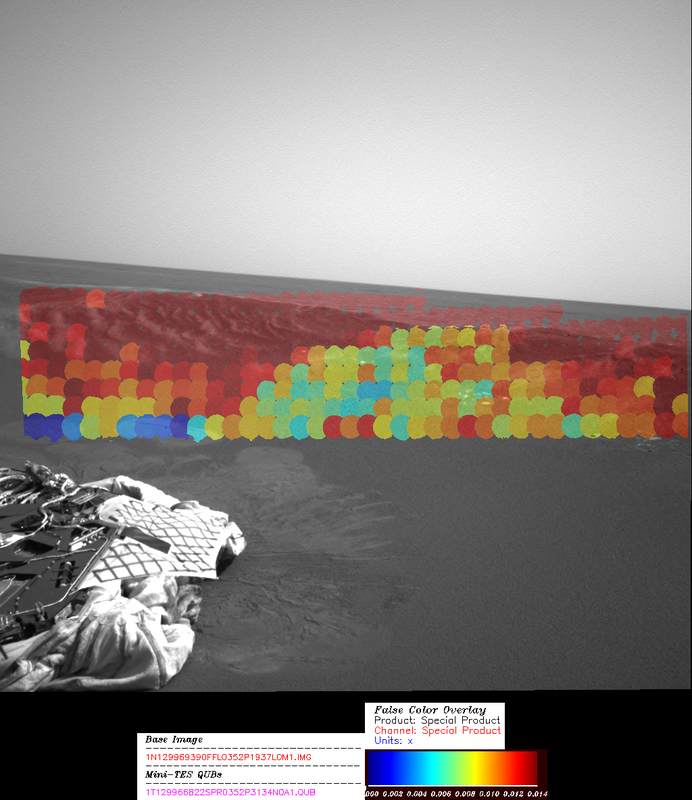 This image shows the hematite abundance map for a portion of the Meridiani Planum rock outcrop near where the Mars Exploration Rover Opportunity landed. It was acquired by the rover's miniature thermal emission spectrometer instrument from a spot called "Echo." Portions of the inner crater wall in this region appear rich in hematite (red). The sharp boundary from hematite-rich to hematite-poor (yellow and green) surfaces corresponds to a change in the surface texture and color. The hematite-rich surfaces have ripple-like forms suggesting wind transported hematite to these surfaces. The bounce marks produced during landing at the base of the slope on the left are low in hematite (blue). The hematite grains that originally covered the surface were pushed below the surface by the lander, exposing a soil that has less hematite.